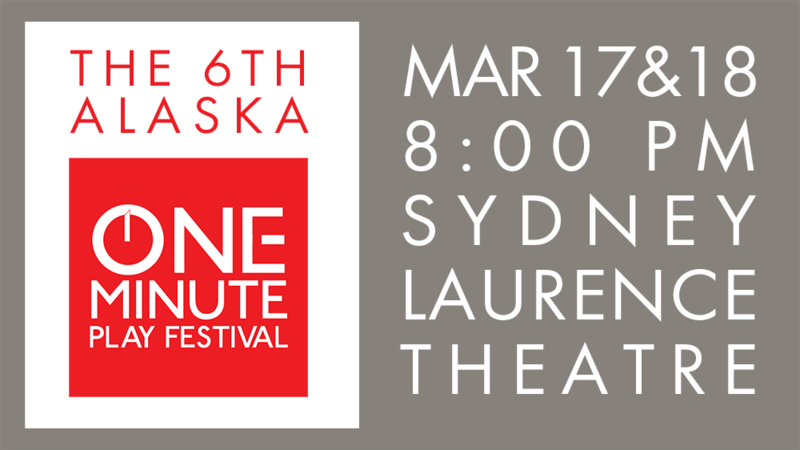 The ALASKA ONE-MINUTE PLAY FESTIVAL (#1MPF) returns to for its sixth year, in partnership with Perseverance Theatre, at the Alaska Center For The Performing Arts. The 6th Annual Alaska 1MPF runs two performances only; Sunday, March 17th & Monday, March 18th at 8pm. All performances are at The Alaska Center For The Performing Arts (621 West 6th Ave, Anchorage AK 99501). Tickets, priced at $20, are available at centertix.com, or by calling 907-263-ARTS (2787). THE ONE-MINUTE PLAY FESTIVAL (#1MPF) is America’s largest and longest running grass roots theatre company, founded by Producing Artistic Director, Dominic D’Andrea . #1MPF is a social barometer project, which investigates the zeitgeist of different communities through dialogue, consensus building and a performance of 50-100 short moments generated by each community. #1MPF works in partnership with theatres and/or social organizations sharing playwright, educational or community-specific missions across the country. The aim is to create locally sourced playwright-focused community events, with the goal of promoting the spirit of radical inclusion. #1MPF represents playwrights of different age, gender, race, cultures, and points of career. The work attempts to reflect the theatrical landscape of local artistic communities by creating a dialogue between the collective conscious and the individual voice. In each city, #1MPF works with partnering organizations to identify programs or initiatives in each community to support with the proceeds from ticket sales. The goal is to find ways give directly back to the artists in each community. Supported programs have ranged from educational programming, youth poetry projects, theatre program in prisons, playwright residencies and memberships, playwrights salaried commissions, community access projects, arts workshops and other social and artistic initiatives. Annual partnerships have been created with theaters in over 20 cities including: New York, Los Angeles, San Francisco, Chicago, Trenton, Atlanta, Philadelphia, Washington, D.C., Baltimore, Boston, Miami, Minneapolis, New York, Seattle, Dallas, Austin, Indianapolis, Anchorage, Honolulu, St. Louis and more, with partnering institutions including Primary Stages, Oregon Shakespeare Festival, New Georges at New York City Center, Z-Space, A.C.T., Trinity Rep, Victory Gardens Theater, Cornerstone Theatre Company, The Playwrights Foundation, Boston Playwrights Theatre, Actor’s Express, InterAct Theatre, Mixed Blood, Walking Shadow Theatre, Passage Theatre, Phoenix Theatre, Kitchen Dog Theatre, Salvage Vanguard & ScriptWorks, ACT Seattle, Perseverance Theatre, Round House Theatre, Honolulu Theatre For Youth and others.